October 21, 2016: Vice Admiral SN Ghormade assumed the charge of Director General Naval Operations today 21 Oct 16 at the IHQ MoD (N). The Flag Officer was commissioned into the Indian Navy on 01 Jan 1984. He is a graduate of National Defence Academy (NDA), Khadakwasla, Pune, United States Naval Staff College at Naval War College, Newport, Rhode Island and the Naval War College, Mumbai. 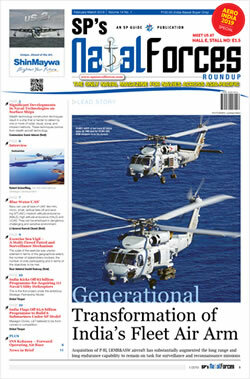 In addition to a specialisation in Navigation and Direction within the Navy, the Admiral holds a M Phil in Defence and Strategic Studies from University of Mumbai, MSc Defence and Strategic Studies from University of Madras and Master Degree in Personnel Management from Symbiosis Institute of Business Management (University of Pune). During his career spanning over 32 years, he has been through a myriad of operational and staff appointments. His operational appointments include commands of the Guided Missile Frigate INS Brahmaputra, Submarine Rescue Vessel INS Nireekshak and Minesweeper INS Allepey and second in command of Guided Missile Frigate INS Ganga. 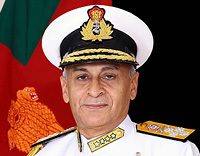 His important staff appointments ashore include Principal Director of Personnel, Director Naval Plans and Joint Director Naval Plans at Naval Headquarters (as separate assignments), Director (Military Affairs) at the Ministry of External Affairs, Local Work Up Team (West), Instructor at Navigation Direction School and National Defence Academy. Upon promotion to the Flag Rank in 2012, the Flag officer has held the appointments of Assistant Chief of Personnel (Human Resources Development) and Flag Officer Commanding Karnataka Naval Area. 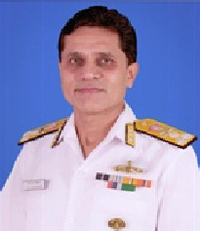 Prior taking over as DGNO he was the Flag Officer Commanding Maharashtra Naval Area. The officer is the recipient of the Nau Sena Medal in 2007 by the President of India and Commendation by Chief of Naval Staff in 2000.